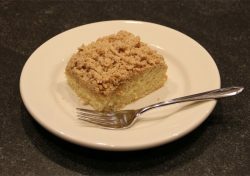 A buttery cake with a thick topping of cinnamon-sugar crumbs. From Cook's Illustrated, May & June 2007, Erika Bruce, p 23. Whisk sugars, cinnamon, salt, and butter in medium bowl to combine. Add flour and stir with rubber spatula or wooden spoon until mixture resembles thick cohesive dough; set aside to cool to room temperature, 10 to 15 minutes. Adjust oven rack to upper-middle position and heat oven to 325 degrees F. Spray 13 by 9-inch square baking pan with nonstick cooking spray. Cut parchment paper or aluminum foil and fit into pan, pushing it into corners and up sides; allow excess to overhand edges of pan. The overhanging paper is needed to lift the cake out of the pan after baking. Transfer batter to baking pan; using rubber spatula, spread batter into even layer. Break apart crumb topping into large pea-sized pieces and spread in even layer over batter, beginning with edges and then working toward center. Do not press crumbs into batter. Bake until crumbs are golden and wooden skewer inserted into center of cake comes out clean, approximately 35 - 45 minutes. Cool on wire rack at least 30 minutes. Remove cake from pan by lifting parchment overhang. Dust with confectioners' sugar just before serving.